Essenceism is a comprehensive analysis of phenomena concerning reality beyond time and space, leading to the discovery of the First Cause in it. This is a website presenting extremely important topics regarding the existence of the First Cause of all things. Knowledge here posted is not a result of any visions or revelations. Its content is the result of a logical analysis of the present knowledge of the universe in the light of the latest scientific achievements, with special regard to information provided by both theoretical astrophysics and quantum physics. Of course, there are only the most important conclusions from the achievements of these sciences. The topics gathered here try to answer briefly the current questions regarding the identity of the First Cause and the existence of reality beyond time and space, commonly known as the spiritual world. There will probably also be further questions about the qualities of this First Cause called in this study the Original Being. Some people will also be interested in the answer to the question of who a person is. I will therefore try to answer all these questions. Below is a list of all topics on this page! (A short note about me - the author of this page - is at the end of this table of contents). 0. Introduction - Who is God? 3. How to imagine God? 0. Essenceism – What is? 1. Essenceism - What is not? 2. Essenceism – Where do we live now? 4. How the universe was created? 8. The miracles are or not? 7. Is there no God among us? 9. Has the Creator’s goal been achieved? I begin the description of my search for the First Cause, search for the roots of the universe and the man himself. I do not want that it to be a religious work, but an research and scientific work at the level of a person who thinks logically and draws logical conclusions. These are the features of the researcher: logical thinking and drawing logical conclusions. That is why I am not ashamed to call my research as a scientific work. When religious themes appear, I will also have a research and scientific distance to them. Only after exhausting all known scientific knowledge and ending logical argumentation I will add emotional arguments, because even the most meticulous researcher is not just a soulless machine. I spent most of my life solving various problems. I did it as a student, and then as a regular employee, engineer, businessman and scientist. I did it because despite my involvement in the usual everyday life, they did not give me peace of mind about existential questions: how I came from, what would happen after my death and whether there was some First Cause of all this? That is why I devoted a lot of time in my adult life to participating in the activities of various religious denominations. It began with a few decades of friendship, still from the student period, with a famous Catholic priest-poet. Then came the time for short-term commitment to various smaller Christian denominations. During post-graduate studies I spent over three years in the Far East, during which I in practice learned the main religions of that part of the world. Finally, I spent many years on a large world religious movement, in which I became a missionary and with whom I traveled a part of the world. As a businessman, I have been able to visit the United States, African countries and Israel many times, where I also gathered a lot of knowledge about topics that interest me. When I got to know the mechanism of churches, religious groups and even sects, I decided to approach religious phenomena like a scientist. This last activity took me over ten years of work and continues. At the beginning, I envied most scientists that they had specific research methods, tools, programs and analytical systems. They had their microscopes, chemical laboratories, hadron colliders and radio telescopes. In the meantime, I did not have any such tools at the moment, because my object of research was God, the spiritual world and non-material beings. For my research, I had only logical reasoning and testimonies of other people who had experienced various spiritual experiences, and then, when they understood them in their own way, they described them. I decided, however, to use the experience of other scientists who, when they could not get to know their research objects better, created new tools for themselves, even at the cost of huge investments. This was the case, for example, with the Large Hadron Collider in Switzerland or with the Hubble Telescope. I did not want my head to remain my only tool, so I created "virtual" tools and logical strings of reasoning to investigate phenomena with which mankind is struggling from the beginning. This is how my analytical system called essenceism was created. The main object of my research was, is and will be God. I want to know who He is, where He is and how He works. This is the content of the larger part of my study. 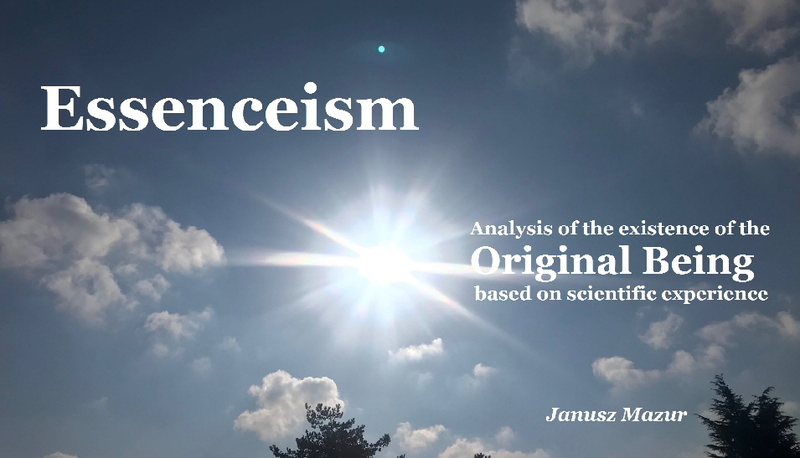 Essenceism corresponds to the questions: Who is God? ; How is He? ; Where is He located? - this is the motto of this site. "God is not from this world – Essenceism"